Published on December 11, 2009 in Bands/Artists, Eastern Iowa, Music, Out and About, Personal History and Upcoming Show. 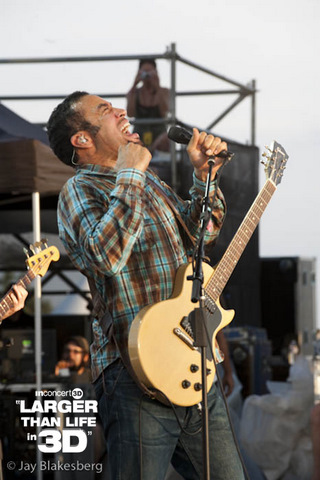 0 Comments Tags: 3D, All Points West Festival, austin city limits, Ben Harper and the Restless 7, concert, Dave Matthews Band, Gogol Bordello, Live, Mile High Music Festival, Movie, Stop Making Sense, The Last Waltz, this is it, Woodstock. Starting Friday, December 11th and running until Thursday, December 17th in selected theaters across the nation a new concert experience will occur. 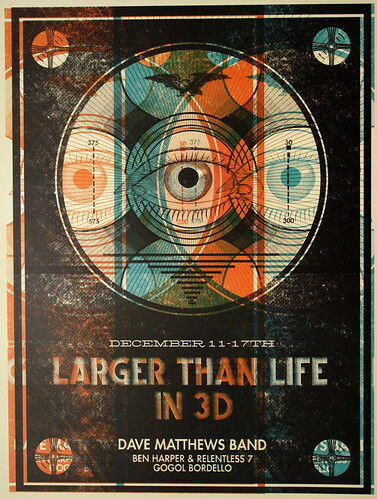 Titled “Larger than Life in 3D” it features concert footage of Dave Matthews Band from the Austin City Limits Festival this year, Ben Harper and the Restless 7 from the Mile High Music Festival and Gogol Bordello from New Jersey’s All Points West Festival. While there have been concerts in the movie theaters before– notably Woodstock The Movie, The Last Waltz, Stop Making Sense, and more recently the Michael Jackson posthumous film “This is It.” What distinguishes this film– obviously from the title– is the fact that it is in High Definition 3D. 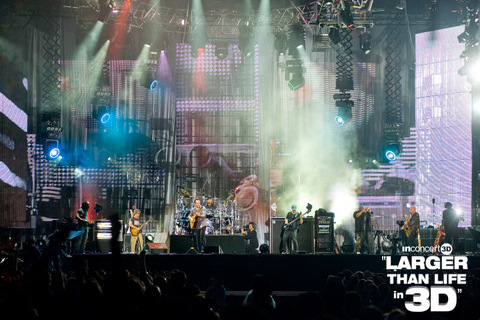 Inconcert3D filmed each of the performances in a manner which provides the audiences a 360-degree view and 3D. 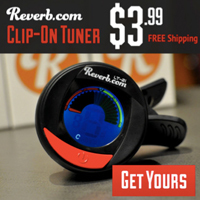 It’s well-established that Dave Matthews Band is a band to see live (even though I have yet to see him live other than on TV) and Ben Harper carries his own clout when it comes to live performances so it makes sense that the first of this kind of concert experience would use these two artists. Gogol Bordello– a “gypsy punk” band from NYC has been around since 1999 purveying their blend of ethnic music and building a fanbase and notariety for their live performances as well. They have been working with Rick Rubin on their next album which will drop in early 2010. In looking into Gogol Bordello, I read the Wikipedia article on the band and was reminded that the band first appeared on my radar due to their relationship to Madonna– they were featured in her directorial debut Filth and Wisdom, and frontman Eugene Hutz is one of the leads. Eugene was also cast as Alexander in the Elijah Wood film Everything is Illuminated. So, this is clearly a band that is making a name for itself– if only in exposure. It looks like they have added new theaters this week, and Cedar Rapids, IA now has two theaters showing the concert! The ticket price for the Wehrenberg Theater is $12.25 for adult tickets. The cool thing about the Wehrenberg is they serve alcohol, so it will be more of an “adult” show. I think this is a pretty cool idea and hope that this takes off and we get more shows like this. I’d go to an extended Bonnaroo show, for example that maybe had a couple of hours of excerpts. I’m going to the shows this week, and will provide a report back on what it was like. I got some promotional goodies like some teeshirts, posters and groovy 3D “passes” that I’ll bring with me and be wearing– if you see me, stop me and I’ll hook you up after the show! I’ll be at the Wehrenberg Theater when I go, but I haven’t decided when. Maybe if you watch my twitter feed, you will know! Click Here to visit the InConcert3D site to search for theaters and tickets near you!